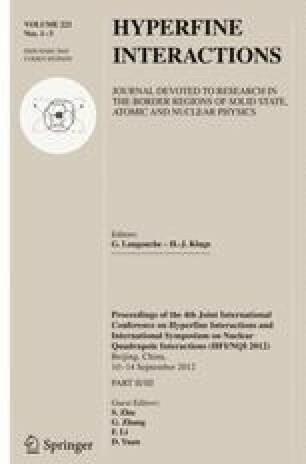 Nuclear quadrupole interactions were measured at 111In/Cd probe atoms in rare-earth palladium phases RPd3 having the L12 structure using the technique of perturbed angular correlation of gamma rays (PAC). Measurements were made for pairs of samples having compositions of the Pd-poorer and Pd-rich boundaries of the RPd3 phase fields, typically 75 and 78 at.% Pd. Two signals were detected in most phases, corresponding to probe atoms on cubic R- and non-cubic Pd-sublattices. Site preferences of parent In-probe atoms were characterized by site-fractions of probes on the R- and Pd-sublattices. For all Pd-rich samples, probes exclusively occupied the R-sublattice, consistent with a heuristic rule that solute atoms tend to occupy the sublattice of an element in which there is a deficiency. For Pd-poorer alloys with R = Tb, Er, Yb, Lu, Y and Sc, probes exclusively occupied the Pd-sublattice. For Pd-poorer alloys with R = Ce, Pr, Nd, Sm and Eu, probes occupied both sublattices, with site fractions varying as a function of temperature. In contrast, probes only occupied the R-sublattice in Pd-poorer LaPd3. Jump frequencies on the Pd-sublattice of daughter Cd-probes were determined from nuclear relaxation caused by fluctuating electric field gradients. Activation enthalpies for diffusional jumps were determined from temperature dependences and found to increase linearly as the lattice parameter decreases along the series Pr, Nd, Eu and Sm. Jump frequencies are believed to have been even higher in CePd3 than in PrPd3, but were too low to be detectable in Tb, Er, Yb, Lu, Y and Sc palladides. A correlation between site preferences and jump frequencies is noted and discussed. This paper provides a complete account of measurements of jump frequencies of Cd-probe atoms and comparisons with similar measurements made on other series of L12 phases. Supported in part by the National Science Foundation under grant NSF DMR 90-04096. Randal Newhouse is thanked for assistance.